Helpero is a site that helps people who use computer around the world to solve any computer related problem. It is an ask & answer site, but most time you just use search its database to find answer, if your answer does not there you can use "Ask Helpero" zone for asking. 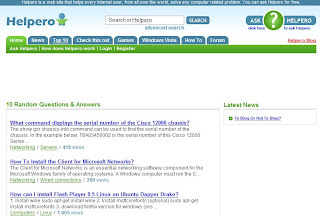 Helpero's subjects cover computers, internet, networking, security, mobile. If you have technical question or just want learn something about computer, maybe that is a good place for you.